Did you know about these 13 questions that can prevent trauma and save lives? In addition to the jail and probation sentence, Mirkarimi, who oversees the city's jails and one of the state's largest law enforcement agencies, will also attend domestic-violence intervention classes for one year, perform 100 hours of community service, pay $590 in court costs and, if ordered by his probation officer, take parenting classes. 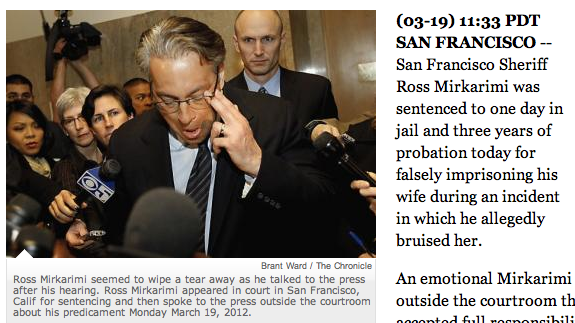 None of the articles mention if Mirkarimi was asked the 13 ODARA questions. I hadn't heard about those life-saving questions until I read this opinion column by attorney Bridget O'Rourke that was published on the Lewiston (ME) Sun Journal site yesterday. She wrote in support of legislation proposed in Maine that would require police officers to do a quick risk assessment to determine if the man (not being sexist here, but it's usually a man) will go after his wife and/or children again and perhaps kill them. O'Rourke supports using ODARA -- the Ontario Domestic Abuse Risk Assessment. The assessment comprises just 13 questions. How can just 13 questions keep women and children safe? Because the answers to those questions can reliably predict a batterer's violent intent. As O'Rourke points out "the time between an arrest and a trial can be particularly dangerous because domestic violence tends to escalate when a perpetrator feels he is losing control". The ODARA research page provides more information about the assessment tool. Developed by the Ontario Provincial Police, the Ontario Ministry of Health, and Waypoint Center for Mental Health Care in Canada, this tool has been tested and validated on hundreds of domestic violence cases to predict future assaults, as well their number and severity. Here's a Toronto Star story about the tool, which is described as "covering an offender's criminal history, substance abuse and whether they've previously violated no-contact orders or other bail conditions". Does anyone know who's using it in the US? Or of other tools like this? "The 13 yes/no questions cover the accused man's history of violence and antisocial behaviour (police record for domestic assault, police record for nondomestic assault, prior correctional sentence, prior failure on conditional release, violence outside the home, domestic assault during pregnancy, substance abuse), details of the most recent assault (physical confinement, threats of harm, victim reported fearing future assaults at time of the assault), and the victim's personal circumstances (number of children, children from a prior relationship, barriers to support)." There are guidelines on how many and which questions are critical; apparently you can make an assessment without five of the above. I'll definitely be doing more reporting on this, and will look for other assessments, too.